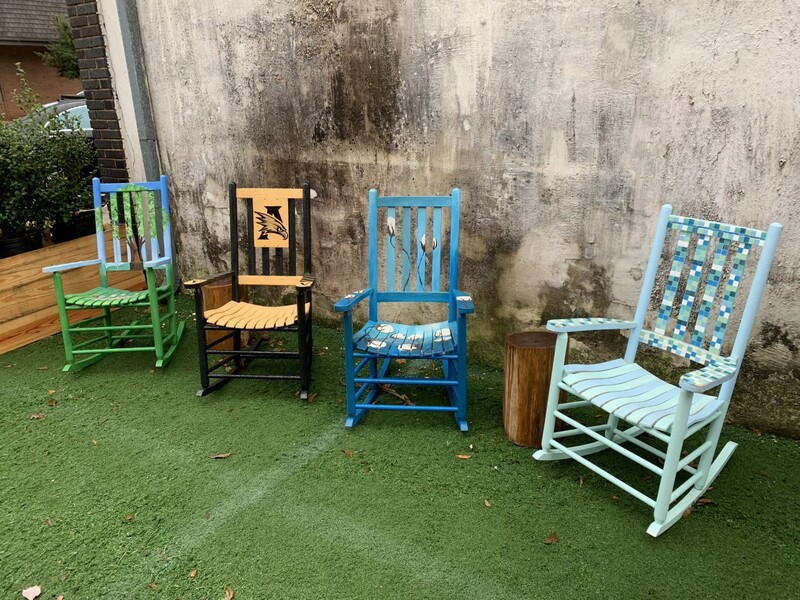 ATHENS, Ala. – The goal for the rocking chairs is to encourage visitors in our downtown district to linger longer and enjoy our downtown merchants and restaurants. The rocking chairs are placed in the pop-up park between Terranova’s and the Athens Main Street office. This project enables us to promote tourism and build a stronger, more united community throughout our downtown district, City of Athens, Ala. and surrounding Limestone County, Ala.
Pam Anderson holds a degree in fine art/graphic design. She has been teaching both private and group art classes for the past 26 years. Anderson teaches at Lindsay Lane Christian Academy. Her classes include elementary, middle and high school students. She chose the Athens Cemetery as the theme of her design because her husband has many relatives laid to rest there. She wanted to take this opportunity to honor those in generations past who played a role in making Athens the great city that it is today. Glennis Osmer Black was born and raised in Killingsworth Cove, a community near Gurley, Alabama. Growing up on the family farm provided an enriched childhood where family, hard work and God were the staples of everyday life. Moved to Limestone county in 1984 and resides in Elkmont. Creativity and Art has always been a passion of Glennis’. Painting provides an escape for Glennis as well as bringing pleasure to her family and friends, which she values deeply. She is the Cosmetology/Barbering Instructor as Limestone County Career Technical Center. Sonya Gordon is passionate about the art she creates in the painting mediums of oil, watercolor and acrylic. Gordon has been painting for over 50 years starting with her first oil class at age 7. She has continued to cultivate her energetic and somewhat whimsical approach in an impressionistic style. She brings her imagination to life on canvas and invites the viewer to join her in a playful day dream, or the reality of fine portraiture. Her Studio is located in High Cotton Arts, an artists incubator in Athens, Ala. You can find her at www.sonyagordonfineart.com and on Facebook & Instagram Gordon’s inspiration for her rocking chair came from her desire to create a fun and whimsical yet sophisticated look that would represent the variety of music, and rich musical heritage embodied at the Scout the Music House once renovated and operational. Denise Maurer, a retired engineer, learned her craft from a good friend approximately 28 years ago. She has been increasing her knowledge and skills by making artwork for friends and family. Through the encouragement of these friends and family she began marketing her art in July of 2017 as a display artist. In May of this year she became a studio artist at High Cotton Arts where she markets her stained-glass art, mosaic creations and jewelry. Students in the Athens High School art club, along with advisor Tavia Slaton, painted the rocking chair. Students’ grade levels range from 9-12. Students that are participating are part of the Art Club at Athens High School and work on service projects for the community. Slaton is a Limestone County native and teaches Visual Arts at Athens High School. Valerie Vaughan is the Athens Middle School Fine Arts Instructor. Vaughan has a B.S. in Art Education with an emphasis in painting from the University of Central Missouri and an M.S. in Art Therapy from Florida State University. She has transplanted to the area from Saint Louis, MO where she grew up. She now resides in Athens with her husband and daughter. Vaughan is an avid traveler and has explored the art worlds of four continents. She is inspired by the works of the Abstract Expressionist. Upon moving to Alabama, she is amazed by the beauty of the fall Cotton fields and chose to paint Cotton as an agricultural staple of Alabama and Limestone county. Thanks to all of the artists and donors that made this project possible. Be sure to take advantage of the rocking chairs while visiting downtown Athens.